Death;s Head II #1 (volume 2). 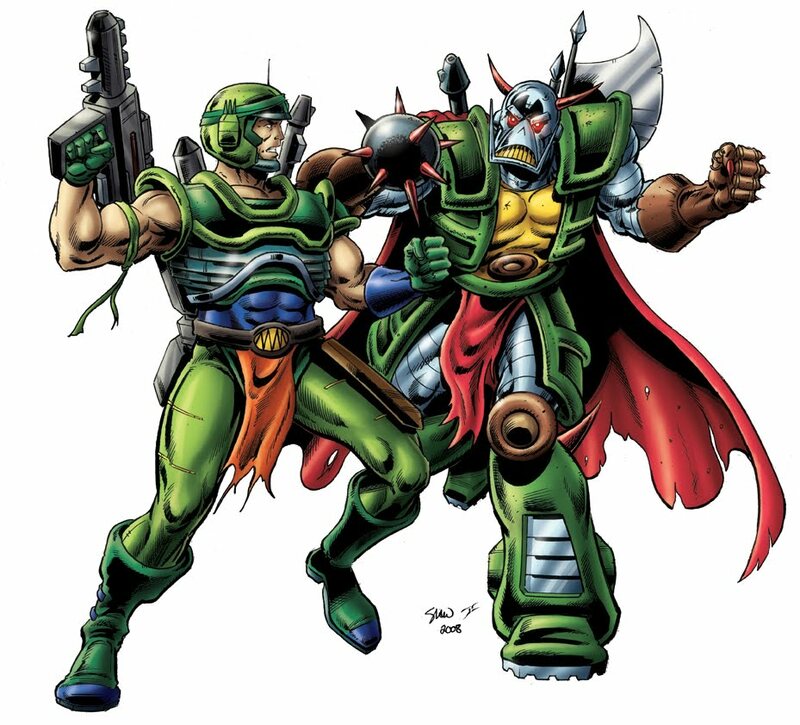 1992 saw the debut of Death's Head II... written by Dan Abnett and featuring awesome artwork by Liam Sharp, who had completely re-designed the Death's Head character to fit in more with the harder-edged type characters that were popular at that time. 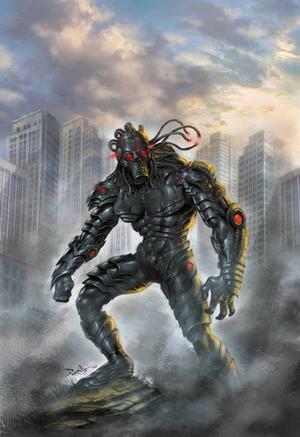 Death's Head II was Minion... a cyborg built by A.I.M scientist Dr. Evelyn Necker to hunt and assimilate the instincts and skills of 106 of the universes deadliest hunters. One of these of course, was the original Death's Head... whom Minion battled and easily destroyed (a battle which I can remember being very short and one sided... considering that the original went one on one with Unicron and survived!!). However, as Minion was assimilating Death's Head.. Death's Head's personality overloaded Minion's systems, and Death's Head became the dominant personality. Death's Head II featured some great stories, and again phenomenal artwork by Liam Sharp... but the character was such a drastic change from the original, losing a lot of the familiar characteristics and quirks that made the original so popular (like ending each sentence with "yes?"). 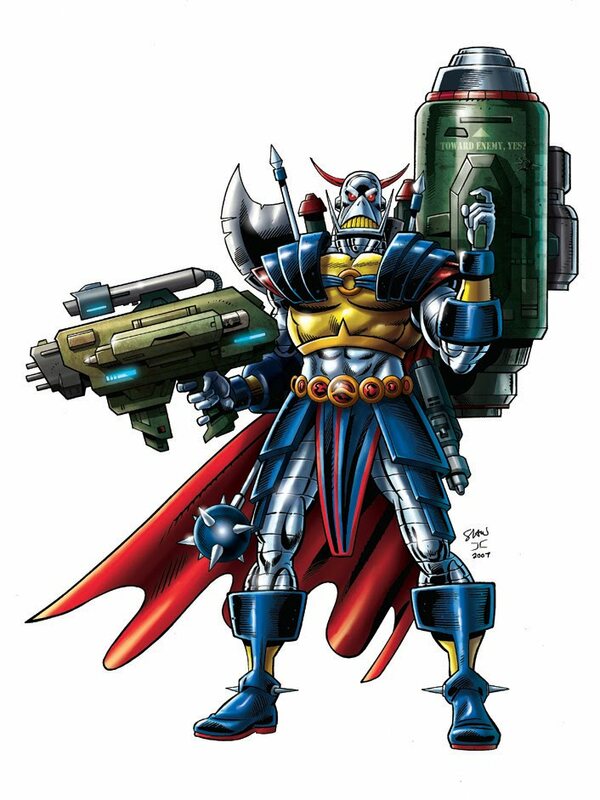 I've always said that I would love Death's Head II if he'd have been a separate character all together, or if the original had have been able to have been kept around... as the character design was awesome, as well as the artwork from Mr. Sharp (and later on Simon Coleby). 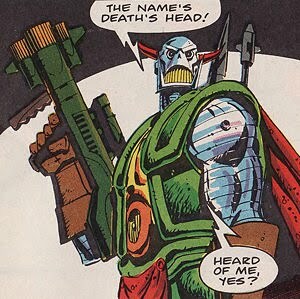 Still, Death's Head II was a very successful title, and was the highest selling of Marvel UK's American style comics.... up until Marvel UK stopped producing titles in the US a couple of years later. Death's Head 3.0 debuted in Amazing Fantasy #16... written by Simon Furman with artwork by James Raiz. The character had very little in common with the original, and instead was a spin-off of the Death's Head guards from the popular Planet Hulk storyline, featured in the Incredible Hulk at the time. Although, Simon Furman had worked out a way to tie this character in with the original... by having the last page of the series hinting at Death's Head 3.0 being an early version of the original. 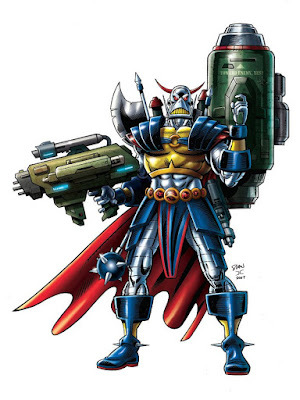 The character was to be shown saying "I'm Death's Head, yes?". However, the clueless editor of the book.. obviously having no knowledge of the original edited out the "yes?" in the final page... thus totally ruining the revelation that Simon had come up with. This version of the character lasted 4 issues and hasn't been seen since... possibly due to fan's disappointment that it wasn't the original who returned, which their online poll had seemed to promise. 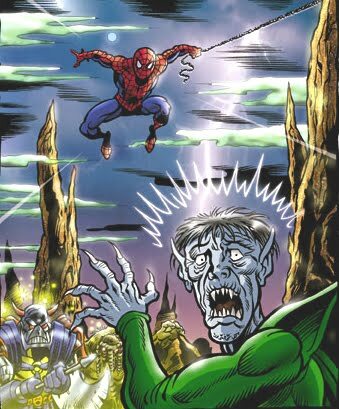 Spider-man Adventures #115. Artwork by Simon Williams. axe-attachment. Again, from Spectacular Spider-man Adventures #115.
of other characters (I had to include ol' greenskin as well!!). Even though the editors of Spectacular Spider-man couldn't feature Death's Head in a prominent team-up, it was great fun sneaking in the character here and there... it even got noticed in a review in Comics International! Shorty after this though... Panini decided to collect the original Death's Head's adventures together in a series of trade paperbacks... and thanks to editor Brady Webb I would get a chance to achieve another one of my ambitions in comics: to officially draw Death's Head. This was an absolute dream come true for me... here are the art pieces that I produced for the two volumes. inks by David A. Roach. Colours by James Offredi. Big guns... pencils by Simon Williams, inks by David Roach. Death's Head vs Dragon... based on their battle in Dragon's Claws issue 5. Artwork by Simon Williams, with colours by Jason Cardy. Again, it was a dream come true to draw these pieces... at last, I was an officially published Death's Head artist! However, I still had it in my system that I wanted to draw a comic strip featuring the character.... so, in my own free time I started drawing up a comic strip that I'd always wanted to see... just for fun. These featured Death's Head in battle with the one character that Death's Head comes second place to in my personal list of all-time favourites: the Incredible Hulk. Incredible Hulk. Written and drawn by Simon Williams. Again, this story was just being drawn up for fun... hence the sketchy feel to the work. However, when I started posting them up on my DeviantArt page, it started to take a life of it's own. The pages were proving to be very popular, and fans were asking what was going to happen next. It was then that I decided to complete the story as part of my convention exclusive sketchbook, Soulman Inc: the artwork of Simon Williams. 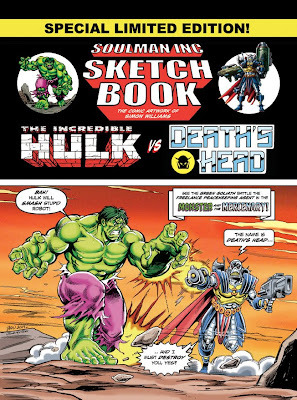 The sketchbook, published in a format which was a tribute to the Marvel UK comics of the 1970's was an Auto Assembly exclusive, sold at both the 2009 and 2010 conventions (and maybe next year as well, if I have any copies left!). The story features a forward by Simon Furman, giving the tale an authenticity... and which included some very kind praise for my little tale. This means a lot to me, as not only is it my first foray into published writing... but I know Simon is very protective of the Death's Head character (thanks for the inspiration Simon!). The story has also had very positive reviews so far... both online and from fellow comics pros alike. As a result of this, plus the many people who asked me at this years Auto Assembly if a sequel was planned, I'm planning a follow up which I hope to be available at next year's Auto Assembly 2011 (more on that soon!). 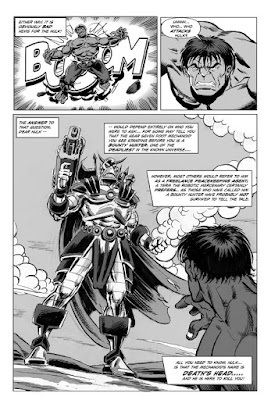 with specially commissioned inks by classic Hulk inker Joe Rubinstein. 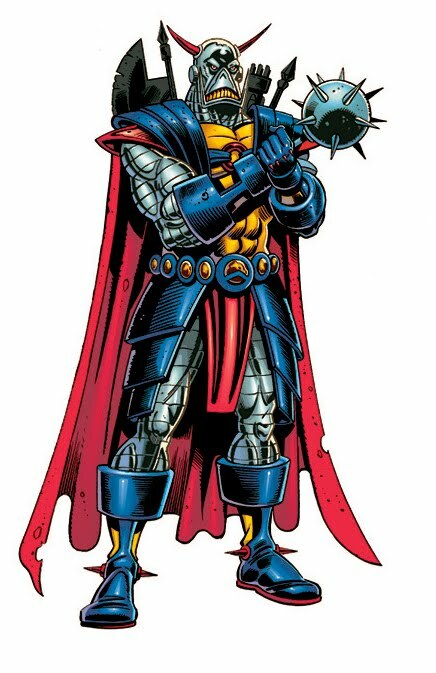 As I mentioned before talking about my involvement with the character, Death's Head made his triumphant return to comics in 2009... in Marvel Comic's S.W.O.R.D title. And it wasn't Death's Head II, 3.0 or any new version... it was the original, Transformer-sized Freelance Peacekeeping Agent (albeit with a slight re-design by series artist Steven Sanders). 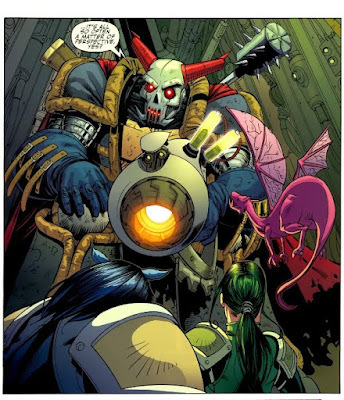 And this truly was Death's Head as we knew him.. with writer Kieron Gillan giving us the best version of the character since Simon Furman (and featuring a VERY clever origin for the 'Freelance Peacekeeping Agent' phrase). As short lived as the title was, it was great to see the character back in print... and gives great hope that we'll see him again in the future. pages of S.W.O.R.D #1 from Marvel Comics. Artwork by Steven Sanders, and written by Kieron Gillan. ..... you just can't keep a good character down, yes? After years in the wilderness (and getting thoroughly hacked off with Marvel UK's treatment of the character in DHII, not to mention the brushing under the carpet of his past in Transformers in the pages of The Incomplete Death's Head), it's nice to know somebody who's kept the flame burning all these years. It'd be nice if they included a reference in Doctor Who, yes? BTW, spookily enough, the verification word attached to this post is Pyral. What are the odds, huh? But of course... WE know it really did happen, yes? Coming a little bit late to the Party here, but a great piece Simon. I really do miss the days of more fluid licensing, which Marvel UK enjoyed in the 80s in particular. DH could show up anywhere, in any licensed book, and it was pretty much okay. I found those days much more fun. Don't get me wrong, it was great to see DH interacting with the main Marvel Universe, with the Fantastic Four or She-Hulk, but I think once he was limited to a certain dimension by the number of 616 it was a little bit of a shame. I'm probably in the minority here, but I was kind of a fan of DH2. When I first read that story it probably made me the most angry I have ever been :) But I still followed that series, ad every other appearance, like a hawk. It was loyalty to the character. The initial 4 issue mini was very much Death's Head. Even down to the occasional 'Yes?' but as time went on, and other writers took him on, he lost that. I think he only really got it back in Liam Sharp's 'Death's Head Gold' which, sadly, was his final Marvel UK appearance. Love your DH vs Hulk, btw. Spotted that on DeviantArt earlier in the year. Great stuff! An incredible shame that SWORD only lasted 5 issues. The US direct market is such a mess right now. When a book can be cancelled on pre-orders, two months before it is released? Insane. But it was great to see a return to the origins of Death's Head. And frankly Kieron Gillen, child of the 80s, was the perfect guy to have been handling him. What I find most interesting about that story though, is that while it clearly IS Death's Head he looks so makeshift. He doesn't call himself a 'Freelance Peacekeeping Agent' (In fact it's The Beast who suggests the term) and he doesn't look quite right. It was my take on this that what we are seeing is a DH from the earliest point in his own life cycle that we have seen. Before Transformers, before he's perhaps made a bit of money and remodelled a more durable form. This is proper Early DH, travelled to 2009. 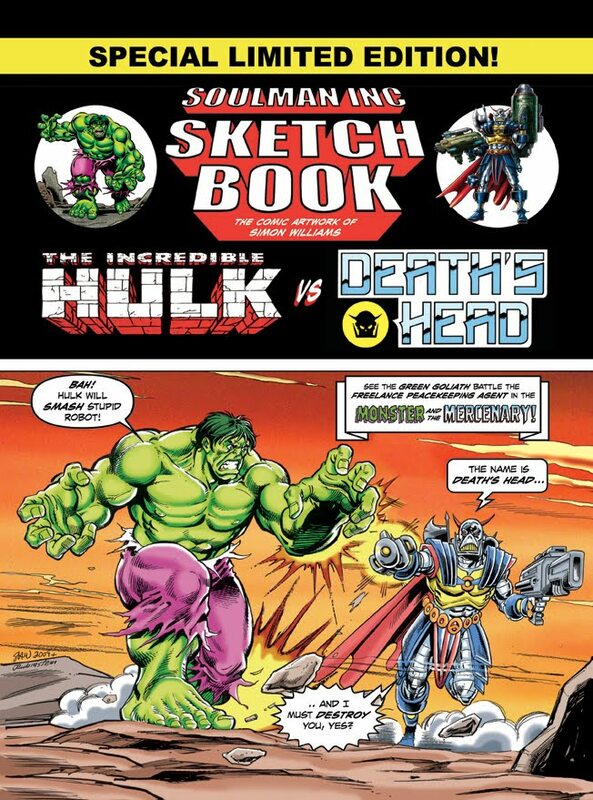 Any chance those of us that can't get to auto assembly can get a copy of the complete Hulkj vs Death's Head, and the sketch book?